Yesterday I had a meeting in downtown San Francisco, and with the weather being as nice as it was, I brought the camera along. 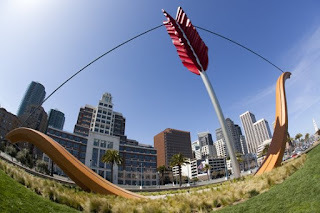 I did not have a lot of free time to scoout locations, but I knew about this sculpture by the foot of the Bay Bridge and thought that it would be fun to try out the new Sigma 15mm Fish Eye lens with my Canon 5D Mark II. I have seen many pictures of this sculpture and wanted to try something different with the distortion of this lens.